Trichy Customs Recruitment 2017 has announced its recent recruitment on its official website. You can find application form on their official site. This job recruitment has released for 16 c11 Posts. 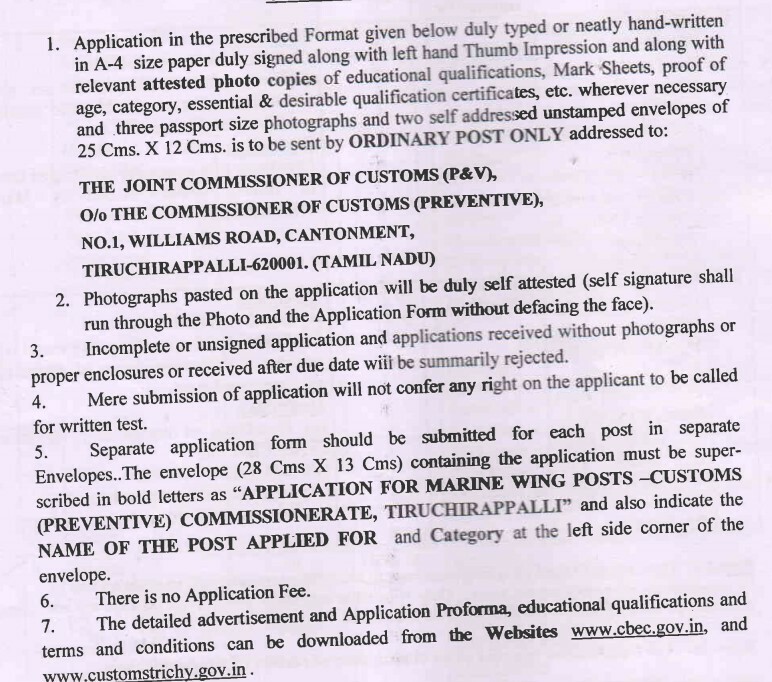 Trichy Customs Seaman, Greaser Jobs. 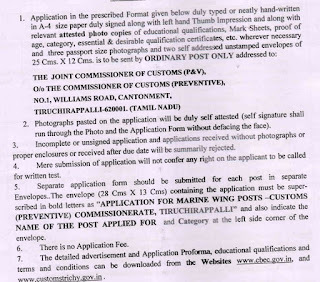 Here you will find all details such as examinations and interview, eligibility criteria, Offline registration processes, payment of prescribed application fee/intimation charges, Trichy Customs pattern of examination, Trichy Customs Syllabus, Trichy Customs Question Paper, Trichy Customs Admit Date Release Date, Trichy Customs Exam Date, Trichy Customs Result Date. Now check below all details. 2. Skipper­mate - Essential:- (i) Holder of 2nd Hand of Fishing vessel Certificate by MMD. (ii) X Class or equivalent. (iii) 5 years sea experience. Desirable Certificate of safety and survival at sea/ fire fighting,/ first aid. 3. Seaman - (i) X Class Pass or equivalent (ii)Three years experience in mechanized vessel with two helmsman and seamanship work. Desirable:- Certificate of competency as fishing vessel" issued by Mercantile Department. 4. Greaser - Essential:- (i) X Class pass or equivalent (ii)Three years experience in sea going mechanized vessel on main and auxiliary machinery maintenance. Desirable:- Certificate of competency as "Engine Driver of fishing vessel" issued by Marine Mercantile Department. Age Limit Should be between (For Post 1, 2, 5 - 18 to 30 Years), (For Post 3, 4 - 18 to 25 Years). The Upper age limit is relaxed by 5 years for SC/ST; 3 years for OBC, 10 Years for Persons with Disabilities (15 years for SC/ST PWD’s & 13 years for OBC PWD’s) and for Ex-S as per Govt. of India rules. Candidates Relaxation in Upper Age limit will be provided as per Govt. Rules.